Satellites tend to generate data and images that are too low in resolution to be useful for precision weed management, especially for the 5- to 10-acre fields common in the Mississippi Delta region. In addition, clouds can obstruct the view of a particular field just as the satellite passes over. Data from aircraft, which typically fly at altitudes of 1,000 feet or higher, cannot distinguish between crops and weeds, let alone GR and non-GR weeds. Ground-based sensors can provide the needed level of resolution, but they have to be moved from place to place within a field. That takes time and can be limited by the field conditions, according to Huang. This view was seconded in a 2015 Bank of America Merrill Lynch global research report that projected agriculture will make up almost 80 percent of the commercial drone market in the future, with the potential to generate $82 billion worth of economic activity in the United States between 2015 and 2025.—By J. Kim Kaplan, ARS Office of Communications. Glyphosate is the country’s most widely used herbicide. More types of weeds are becoming resistant to glyphosate. 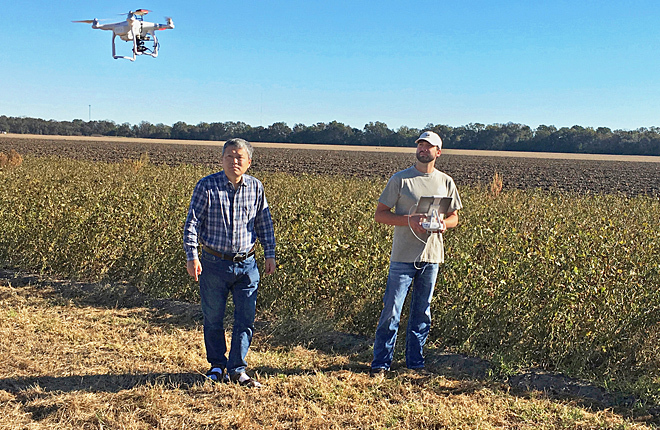 ARS is using drones to pick out glyphosate-resistant weeds in a field. Drones have potential to generate $82 billion in economic activity over 10 years.